Elope in ease while we handle the details! 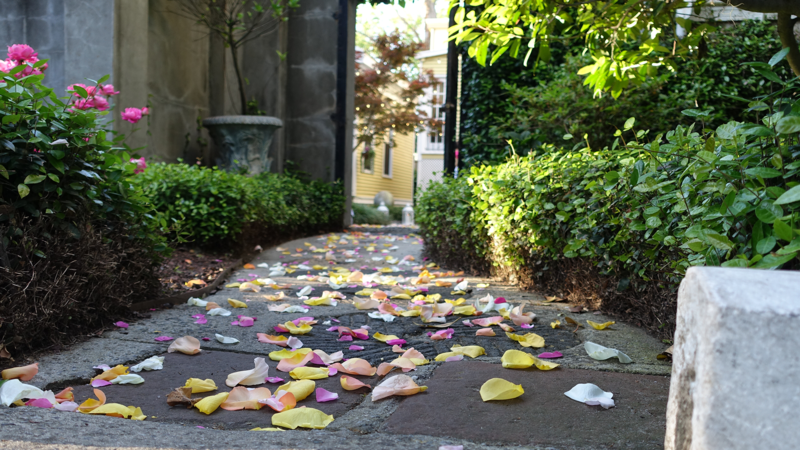 Eloping at our Historic Savannah Bed and Breakfast is a magical experience. From the minute you walk into the door, you’ll be immersed in the Grand Savannah charm and history. Our bed and breakfast was built in 1893, and our courtyard is original to the building. It’s a spacious place and a wonderful setting to honor your commitment. Bobbie Jo, our experienced wedding coordinator, will help you with all the details, from booking your officiant to choosing your cake. Every step of the way, we’ll be there for you. Whether you want to keep it simple or more involved, we are with you every step of the way. We coordinate many large affairs every year, and will pursue yours with the same gusto as a 45 person ceremony. First, what size were you thinking? Looking for more? Check out our Grand Savannah Package! "... I definitely would give the staff 5 stars as they were all very accommodating and welcoming. they way to make sure our wedding was perfect and everything we wanted. The inn itself also makes for beautiful pictures if anyone else is considering a small wedding or elopement as the inn supplies almost everything at a reasonable price. " Our elopement ceremony is designed to be a private affair with 10 or fewer guests. After the vows are said, you can enjoy going out and taking pictures on Forsyth Park. Afterwards, we’ll host an intimate cake cutting ceremony, with an 8-inch round cake of your choice! Contact us today! We’ll be in touch just as soon as we can! "I don't know where to begin. Our wedding weekend was beyond perfect and we attribute most of that to the staff at Forsyth Park Inn. The venue is stunningly gorgeous - I can't even put it into words. We went with the Grand Savannah wedding package and are so glad we did. Bobbie Jo - wedding Coordinator - took care of everything! I told her want I wanted and she made it happen! All of our guests were in awe at how beautiful and comfortable everything was, from the time they arrived, until the time they left. If I could give 10 stars I would! I can't possibly recommend enough. If I had it to do over again - I would choose Forsyth Park Inn again and again." "We had a magical, perfect wedding in the garden at the Inn on March 14, 2017. It couldn't have been more perfect and I can't say enough about how amazing wedding coordinator and Dwayne were to work with. Every detail was perfect and they made planning a destination wedding from out of state as easy and smooth as it could be. The Inn is beautiful and the food is wonderful; t's the perfect place for an intimate destination wedding!" Our Simply Savannah Wedding Package offers an incredible wedding for you and your guests. We work with you every step of the way to set up your dream ceremony by helping you plan and put together all of the details. The package is built for up to 45 guests, with amenities designed for an intimate and elegant affair. We work with you to help put together your kind of wedding! From the moment you reach out to us, to the moment you walk down your rose petal path, our staff is at your disposal. On your wedding day, our wedding coordinator, Bobbie Jo, is with you and working for you, making sure everything you discussed is well taken care of. After the vows are said, you can enjoy going out and taking pictures at Forsyth Park. Afterwards, we’ll host an intimate cake cutting ceremony, with a 2 tier wedding cake of your choice!